Yesterday, the sun and moon were side-by-side, hanging low in a blood-red sky. Earlier, a two-headed calf was born in Swanton. It rained frogs in Bradford for a full hour. These omens can only indicate one thing. It is time once again for the Monster of the Month! 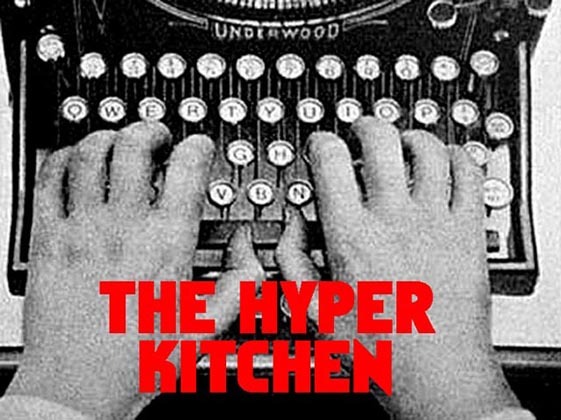 For those of you who are new to the Hyper Kitchen (and god bless you, sirs and madams! ), every month we serve up a new monster for your approval. This March, we descend into the dark realm of teuthology to bring you the infamous Vampire Squid from Hell. For fans marine biology or H.P. Lovecraft, this little oceanic freak ought to be a interesting find. 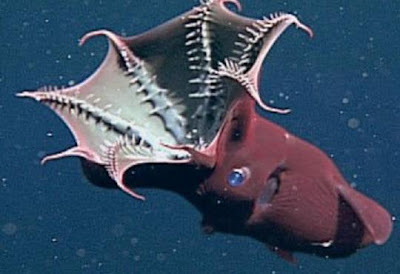 The Vampire Squid from Hell (known by the scientific name of "vampyroteuthis infernalis") is a deep-sea cephalod first discovered in 1903 by a German biologist named Carl Chun. Chun was undoubtedly inspired by the squid's black flesh and red eyes when selecting a name. Additionally, the squid's tentacles are connected by webbed membrane, visually similar to the membrane of a bat's wing. 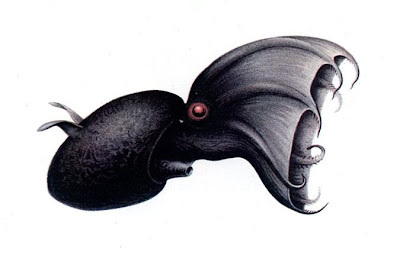 The Vampire Squid from Hell dwells in some of deepest parts of the ocean, an ebony environment referred to as the Oxygen Minimum Layer. Though it is called a squid, it is actually a relative of both octopi and squids, belonging to its own distinct order called Vampyromorpha. They utilize ear-like fins to propel themselves through the water, and attract their pray with bioluminescent strands. Unfortunately, the Vampire Squid from Hell falls somewhat short of its undeniably fearsome name. It does not drain blood, nor convert other cephalopods into Vampire Squids from Hell. They only grow to be around a foot long, so they could never wrap their tentacles around some unfortunate submarine. The eerie jet black skintone of some specimens is not even the norm, and others have been observed to be a pinkish-orange. Still... you wouldn't want to encounter one on some dark evening. What to learn the full biological specifications of the Vampire Squid from Hell? Look no further. How to cook it ! 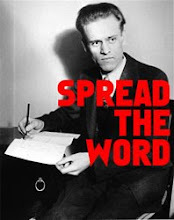 Better than Sigourney Weaver in a British educational film.